A few blocks away from the market, Tsukiji Tamura is a top destination for kaiseki cuisine by third generation chef Takashi Tamura. His father, Teruaki Takashi has penned a book (Japanese and English) that demystifies many of the rituals of this stylized cuisine, “The Elegant Art of Japanese Food and Manners”. The main dining room has several tables and the noon meal is often filled with ladies who lunch. Private rooms are also available for an extra charge. Lunch is a bargain for the several courses. 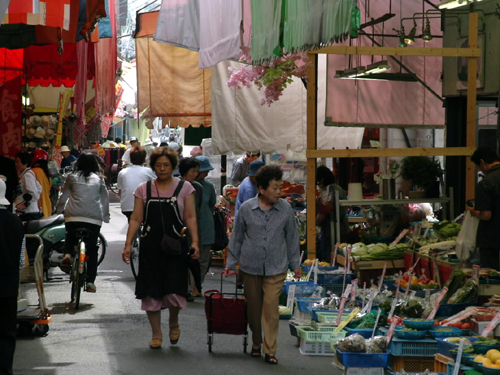 Tsukiji Tamura is just a few blocks away from Tsukiji Market. 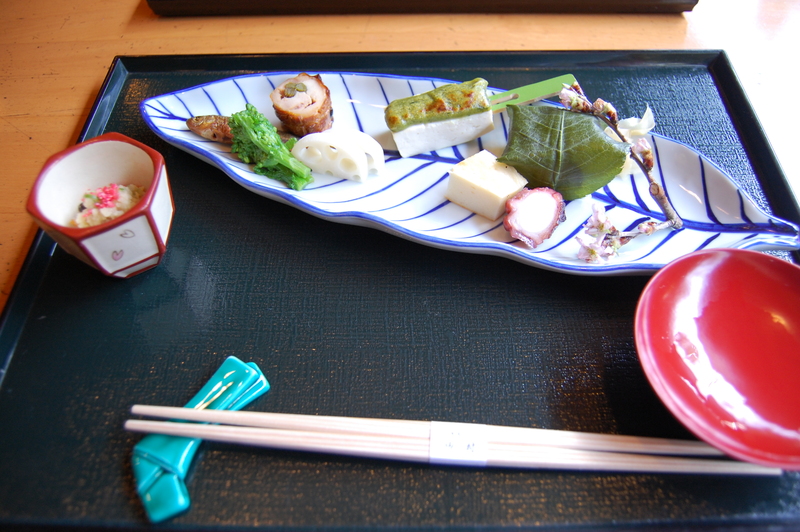 Just some of what came with this course is pickled renkon (lotus root), Tsukudani fish, nanohana (the greens), sushi wrapped in sakura leaf, grilled tofu with an herbed miso sauce, and octopus. 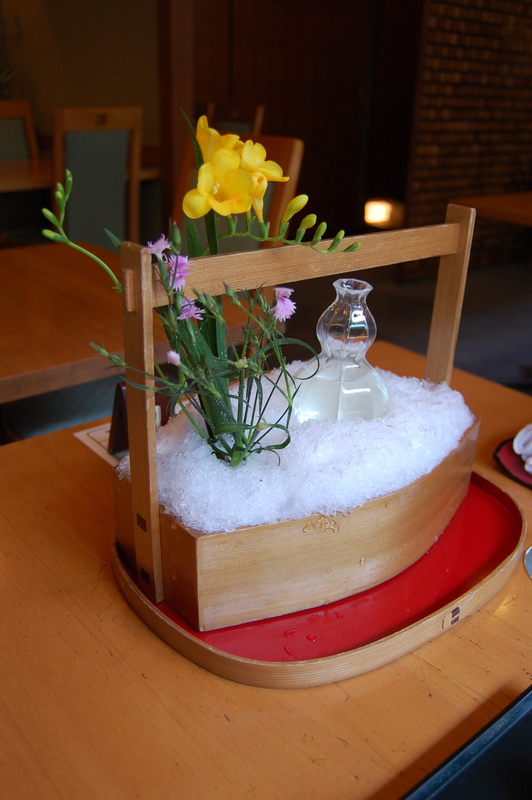 The sake is served in a wooden boat filled with crushed ice, and I love the fresh flowers. The attention to detail here is impressive. 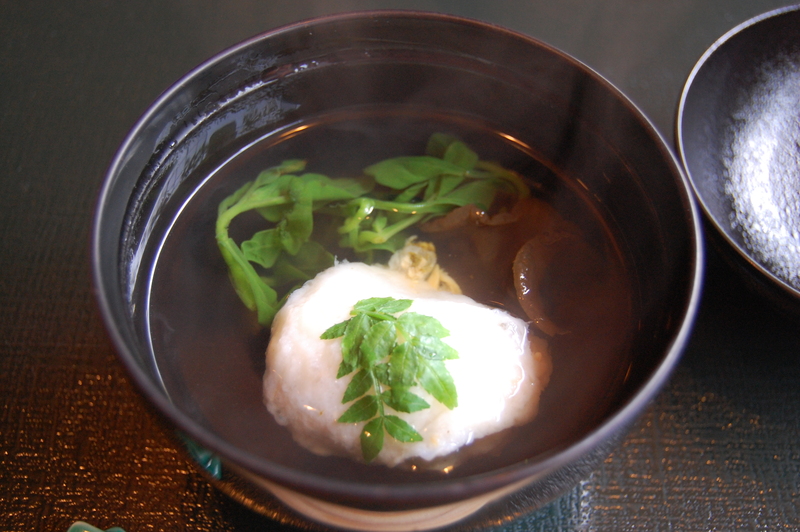 Fish meat is ground to a paste for this fluffy ball in dashi broth with bitter greens and mushrooms. Note how the squid on the far right is just slightly scored to make it easier to chew on. Again, the attention to detail by the chef is amazing. My favorite course was the grilled fish. 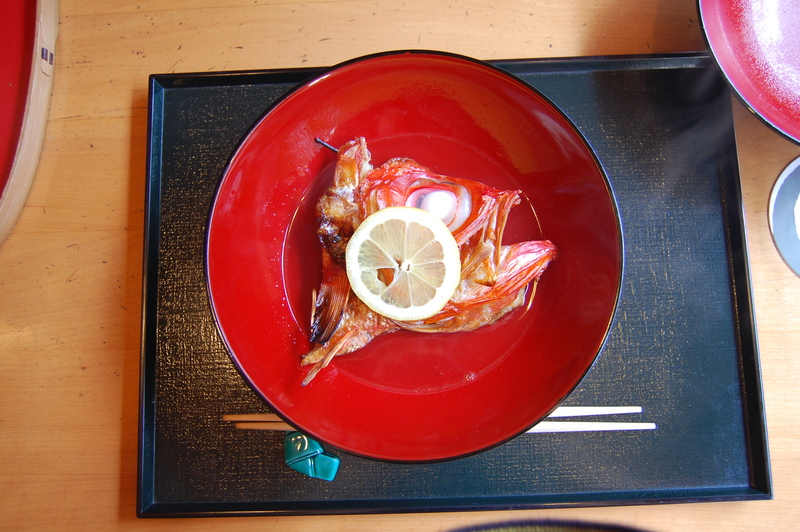 Kinmedai (splendid alfonsino) is grilled and served in a broth. So simple, just salted, grilled, presented in a broth with a slice of lemon. Scallops with warabi (fern), takenoko (bamboo shoots) and a colorful dressing (I forget, but think it included oranges). 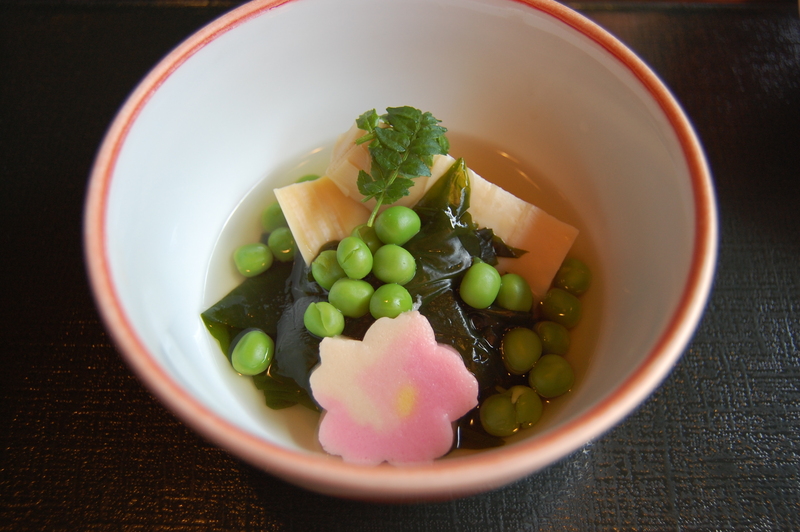 This dish sings of spring with the takenoko (bamboo shoots) and green peas. The pink flower in front is nama fu (wheat gluten). 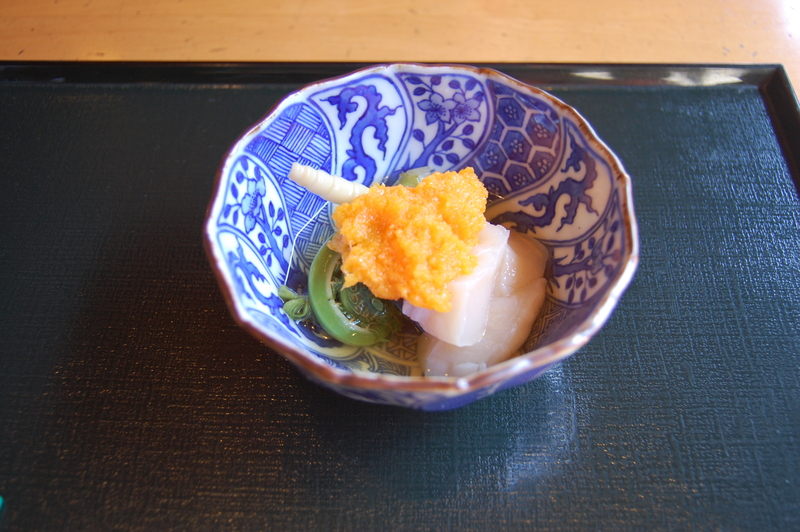 The rice course (shime) was in a broth with mitsuba. As you can see it comes with pickles (handsome husband not included). Strawberries are available year-round in Japan due to greenhouses, but you do see more of them in the markets starting in December and January. 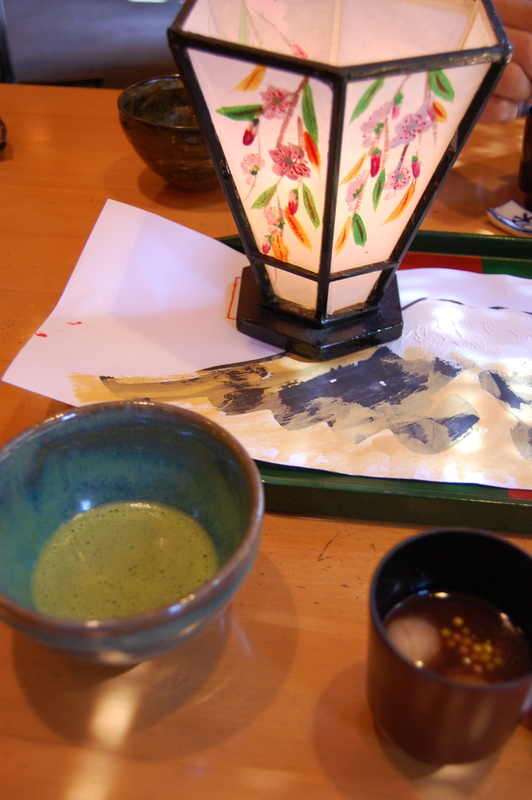 And just when we thought we were done, as many kaiseki restaurants end with a fruit course, the kimono-clad waitress came out with a tray with a paper lantern and a picture of Mount Fuji (painted by the father of the chef). This course was a sweet azuki bean soup with mochi dango (sticky rice balls) and mattcha green tea. A great lunch and highly recommended. There is no better place to invest in a knife than Japan. 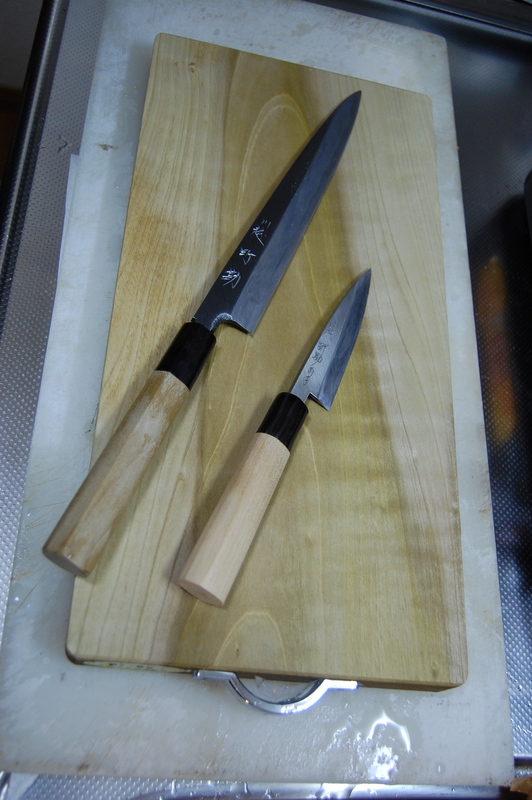 Although they are not inexpensive, if cared for properly, Japanese knives will last a lifetime. 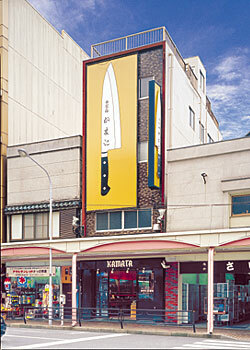 A good knife shop will also carry Western-style knives made in Japan that are sharpened on both sides. 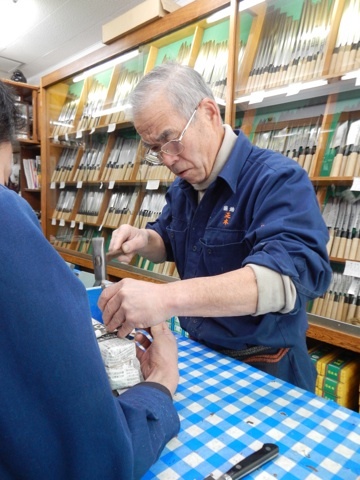 Traditional Japanese knives are sharpened only on one side, and Westerners will find that cutting with them can take a bit of getting used to (be sure to let the shopkeeper know if you are right- or left-handed). Although most knives sold in the West do not rust, Japanese knives made from standard carbon steel rust easily. You may want to ask for a rust-resistant carbon steel that is easier to care for. Where to get your knives in Tokyo? My friend Junko Nakahama is a food and wine writer in Tokyo. She has recently started to conduct Saturday tours of the popular shoutengai area Yanesen (Yanaka, Nezu, and Sendagi). This article from Metropolis magazine (by my editor Steve Trautlein) interviews Junko on some of her favorite foodie spots in Tokyo. Some people become food writers because they love to eat, others because they love to write. For Junko Nakahama, her career came about as a matter of necessity. While studying American literature in the US in the mid-’80s, the Hokkaido native fell in love with the Long Island, New York area, and decided she wanted to stay. Her parents had other ideas, however, and told her she would have to make do without their help. So Nakahama supported herself by writing travel articles, then gradually shifted her focus to food and wine. After taking cooking classes and attending wine school, she won accreditation from the Japan Sommelier Association. Now back in Japan, she writes restaurant reviews, winery reports and dining stories for a variety of magazines, with a special focus on the shitamachiarea of Yanesen; she also organizes English guided tours of the neighborhood called Omiyage Concierge. “I respect cuisine and ingredients which express the homeland and craftsmanship of the producers,” she says. Here are her recommendations for tasting theterroir of Tokyo. Because I write so many restaurant reviews, I often eat two lunches and two dinners a day. So on a free night, I like to have a light meal of vegetables and fish with a glass of natural and gentle wine. Tabegotoya Norabo is a sacred place for veggie lovers. 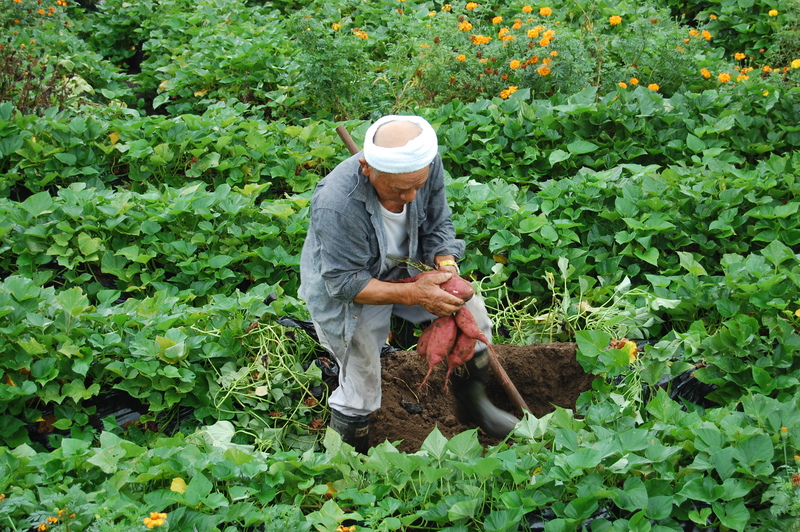 Chef Makio Akemine visits farms every morning and recreates their scenery in his dishes. I am so happy to fill my body with such healthy and beautiful vegetables. Aizbar is a small wine bar owned by a female chef named Ai Eto who selects wonderful American wines. She has over 80 varieties of vegetables on the menu every night; her signature dish is a salad with more than 30 greens, herbs, root vegetables and traditional Japanese veggies. She prepares each vegetable individually—for example, udo (a mountain plant which produces fat, white, edible stalks) is dipped in vinegared water, and renkon is marinated in champagne vinegar. She offers seasonal fish like lightly grilled mackerel, and her cooked vegetable dishes and risotto are also excellent. Chinese restaurant Wasa is a new addition to my list. Owner-chef Masataka Yamashita apprenticed at well-known Kaika-tei in Gifu Prefecture. You can enjoy a menu full of vegetables and fish here—sautéed horse mackerel with a smoky flavor, sardines with Chinese pepper, eel with green beans and miso sauce. Yamashita doesn’t use artificial seasonings, so you’ll be surprised by the natural flavor and fresh aftertaste of these dishes. 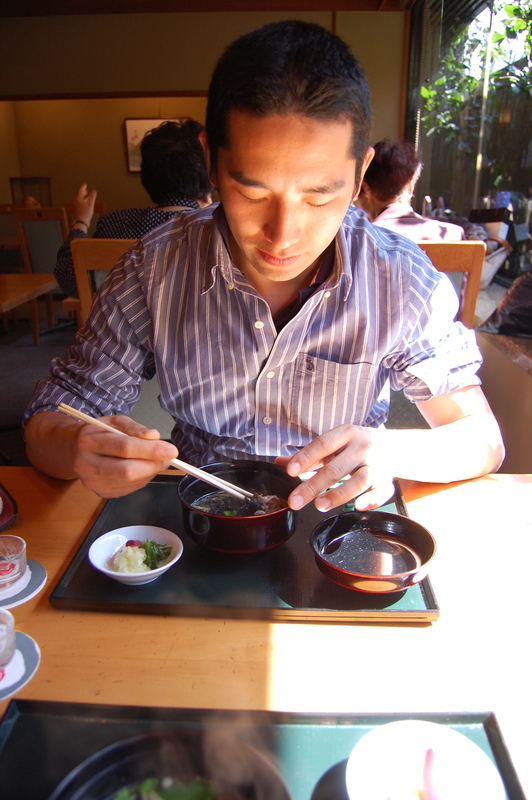 I often go to the cozy family-owned restaurant Ocha to Gohan-ya with my non-Japanese friends. The father is a grand chef of fish, the mother cooks vegetable dishes, and the daughter does the desserts and the interior decorating. There are around 15 dishes with steamed rice served in ohitsu (wooden containers), with miso soup, at very reasonable prices. When I’m having a private dinner, I drink only all-natural wines. 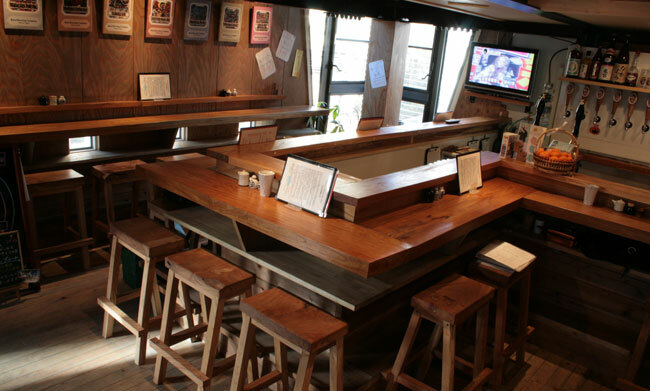 Uguisu is the most popular wine bar in Tokyo now. All the wine on the list is “bio,” and you can have most of them by the glass at unbelievably reasonable prices. Makoto Konno, the owner-chef, prepares the traditional French cuisine with a nicely casual taste. His salad with 15 vegetables and couscous is my favorite. La Nuit Blanche is a small wine bar owned by Toshinaga Haba, who introduces each wine by telling the story behind it. The authentic Italian cuisine is much more delicious than wine-bar standard. Yamariki just might be the most inexpensive wine bar in Tokyo. In fact, it opened 58 years ago as an izakaya, but the third-generation owner has trained as a French chef and the manager is a certified sommelier. They have a good selection of natural wines, and the pours are extremely generous (Yamariki is undergoing renovation until December; until then, visit the nearby annex). Méli-Mélo is a cozy restaurant with casual French cooking and an excellent selection of wines. Owner-chef Yasuo Munakata apprenticed in France for five years and selects the wines himself. Bistrot Vivienne, owned by a charming lady named Junko Saito, has a good selection of natural wines, too. The energetic atmosphere is also nice. Nodaya is one of my favorite wine shops. Kouhei Sato, who runs the store with his parents and wife, has a huge knowledge of natural wines and is a great supporter of Japanese producers (above). He holds a monthly casual wine party with the customers and invites producers as well. It is a wonderful occasion to exchange observations with the person who made the wine. 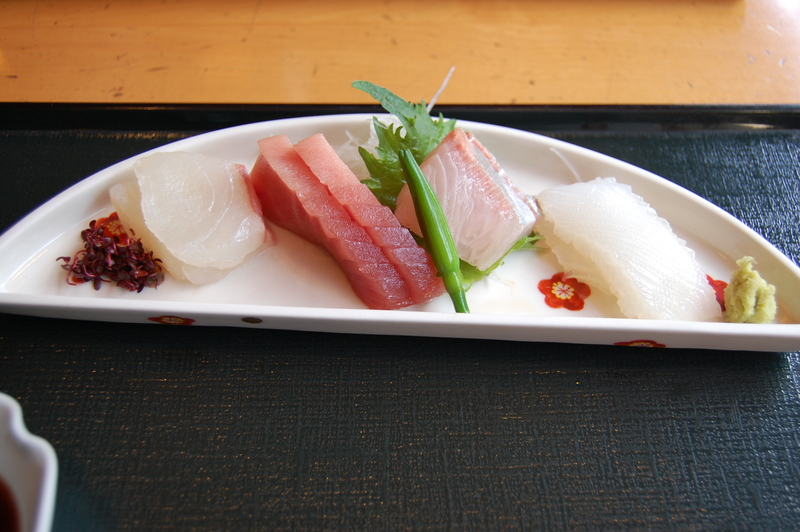 Nodaya also sells traditional Japanese seasonings like shoyu,mirin, katsuobushi, etc. I drop by the delicatessen Atelier de Mannebiches whenever I am tired from work and don’t want to cook. They offer French home cooking like quiche, paté, caviar d’aubergine and delicious desserts. 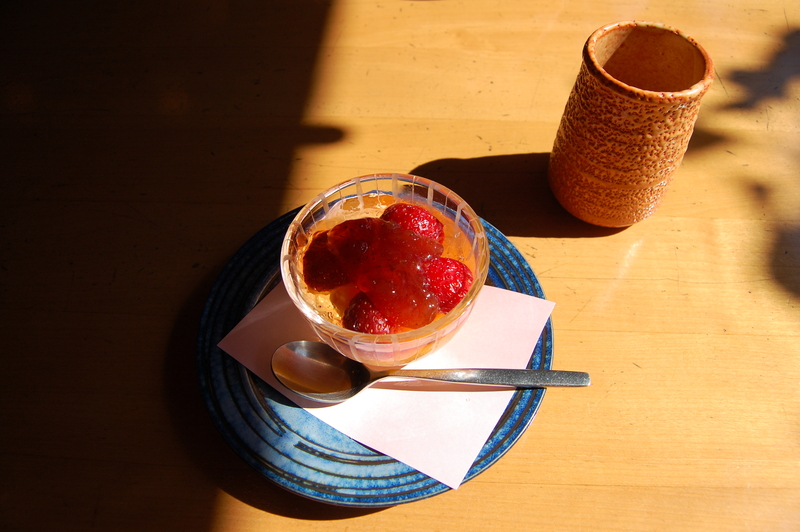 My favorite bakery-cafe is Konohana, owned by a pair of pretty young sisters: Mayumi bakes a variety of breads using natural yeast and organic ingredients, and Megumi is in charge of drinks. I have attended their baking class and enjoy baking by myself now. Unfortunately this might be difficult for readers to take advantage of, but my favorite chef is Hitoshi Kakizawa, who teaches my Japanese cooking class. Although it is a hands-on class, he sometimes cooks himself and offers a traditional kaiseki course to us. 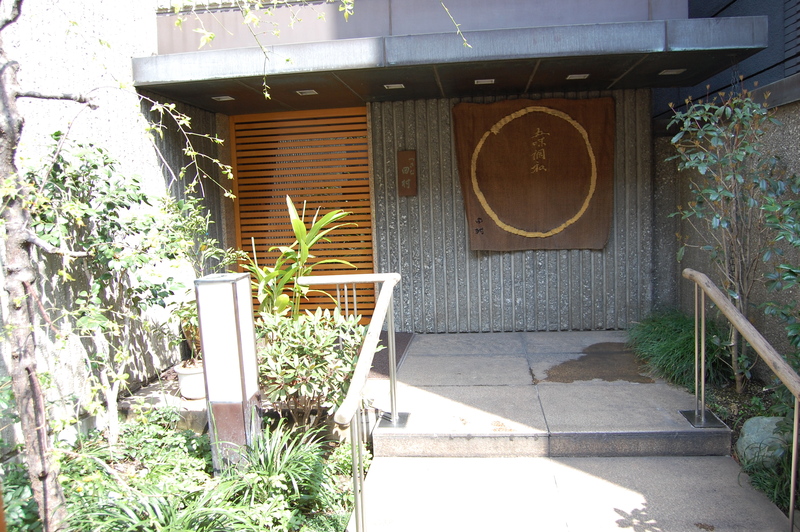 Kakizawa is the second-generation chef of a kappo restaurant named Tsuruju in Toranomon. It closed about five years ago and since then he’s been introducing his technique and philosophy to students. The summer course menu the other day was goma tofu (paste made of ground sesame), hamo-chiri (boiled conger pike served sashimi style), sardines with Japanese plum sauce, rice with sliced sea bream dipped in a sesame sauce, and more. The courses were beyond delicious and made us happy! Omiyage Concierge Tours on Oct 17 & 24. ¥500 per person, includes map. Email jun-nakah@pop12.odn.ne.jp or see their homepage for more info. Aizbar 2F, 2-26-5 Kami-Osaki, Shinagawa-ku. Tel: 03-5434-0117. Open 6pm-1am, closed Sun. Nearest stn: Meguro. Atelier de Mannebiches 1-2-2 Nishi-Kata, Bunkyo-ku. Tel: 03-5804-4242. Open Wed-Mon 10am-8pm, closed Tue. Nearest stn: Kasuga (Mita line). Bistrot Vivienne 4-13-19 Ginza, Chuo-ku. Tel: 03-6273-2830. Open Mon-Sat 6-10pm, closed Sun & 3rd Mon. Nearest stn: Ginza or Higashi-Ginza. La Nuit Blanche B1, 7-2-8 Ginza, Chuo-ku. Tel: 03-6909-9561. Open Mon-Sat 6pm-3am, closed Sun. Nearest stn: Ginza. Méli-Mélo 4-5-4 Iidabashi, Chiyoda-ku. Tel: 03-3263-3239. Open Mon-Fri 11:30am-3pm & 6pm-midnight, Sat & hols noon-4pm & 5-11pm, closed Sun. Nearest stn: Iidabashi. Ocha to Gohan-ya 3-42-8 Sendagi, Bunkyo-ku. Tel: 03-5814-8131. Open Mon-Sat 11:30am-2pm & 5-8:30pm, closed Sun. Nearest stn: Sendagi . Tabegotoya Norabo 4-3-5 Nishiogi-Kita, Suginami-ku. Tel: 03-3395-7251. Open Tue-Sun 5pm-midnight, closed Mon. Nearest stn: Nishi-Ogikubo (Chuo line). Here is the link to her Omiyage Concierge site offering more information on the Yanesen tours (at a basement bargain price!). Tell her Yukari sent you. Depending on how shochu is aged will be reflected on the palate. 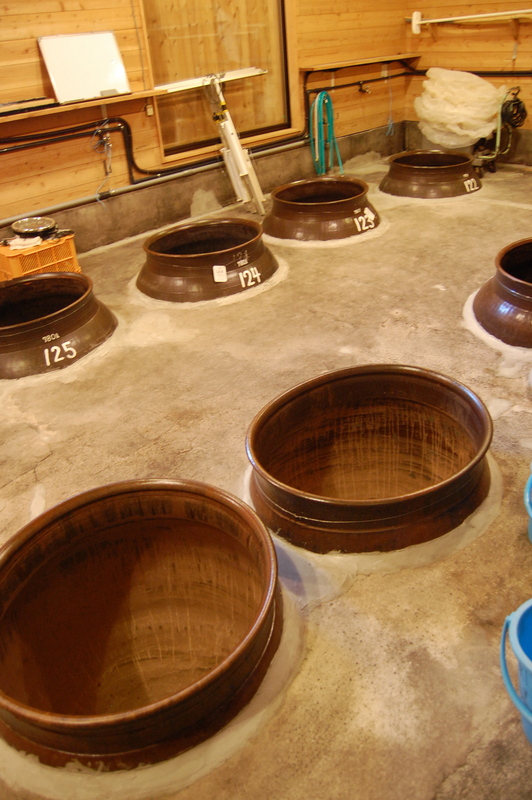 Shochu is often aged in tanks, ceramic pots, or barrels. Aged in stainless steel tanks the shochu will retain more of the base ingredient. As ceramic pots are allowed to breathe the shochu softens and rounds out on the palate. Naturally, aging in a wooden barrel will add tannins and color to the shochu similar to whiskey. Finally, aging a shochu for a long period will let it meld and come together making it smoother and gives it a longer finish. Ku-su (クース) is aged awamori. It must be aged a minimum of three years, and be at least 50% or more to be labeled as ku-su, and is often aged in ceramic pots. Shochu is made in every prefecture of Japan, which can’t be said about sake as it is not brewed in Kagoshima. Shochu is so prevalent on the southern island of Kyushu, that in many places when you walk into a restaurant and ask for sake, a generic term for alcohol, you may be given shochu. Similar to learning village names of Burgundy, it is good familiarize yourself with the names of the prefectures of Kyushu. Shochu Authority has one of the best selection of shochu and awamori in the city. There is so much to choose from and the knowledgeable staff can help you find whatever you are looking for. It is conveniently located inside of Tokyo station. It is inside of the station building, but outside of the ticket gate. • The most important thing to remember when buying shochu, look for honkaku shochu 本格焼酎. • Antenna Shops will have good selection of local shochu. Check out Kagoshima (antenna shop chapter) and Miyazaki (see Shinjuku). 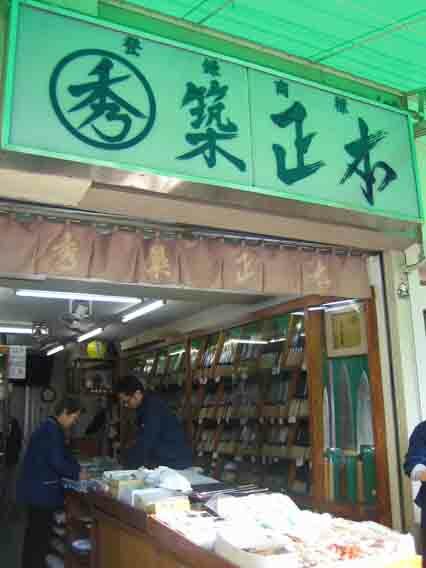 • Depachika usually carry a selection of the popular brands.